Our Christo’s Kids Menu includes wholesome and hearty options, with tried and tested favourites. Our Kid's Menu is available at all cafes and is for kids 15 years and under. 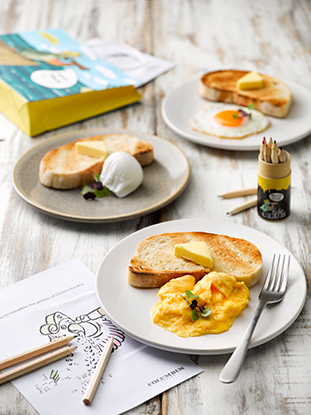 Free Range Eggs on Toast – served on your choice of five grain, ciabatta or gluten free toast, the perfect start to the day for little ones! Fluffy Hotcakes – one of Christo’s favourites with berries and maple syrup or bacon, banana and maple syrup. Kids Toastie and Drink – a Kiwi classic – cheese & ham or cheese & tomato with a hot drink. Columbus Mini Breakfast – yummy streaky bacon, sausage, a free range egg on ciabatta bread - for growing little Kiwis! cinnamon french toast fingers stacked sky high! Served with lemon curd and berry compete. Additional options vary cafe to cafe – just ask us in store! Best of all, our activity pack comes free with any Christo Kid's Menu purchase! Sure to keep little ones busy with fun activity sheets, stickers and more! While stocks last.